Michelle Rodriguez was in attendance at the BFI London Film Festival premiere of ‘Widows’ on Wednesday (October 10). 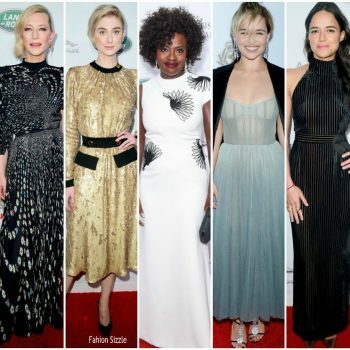 She wore a white Julianna Bass Fall 2018 gown. 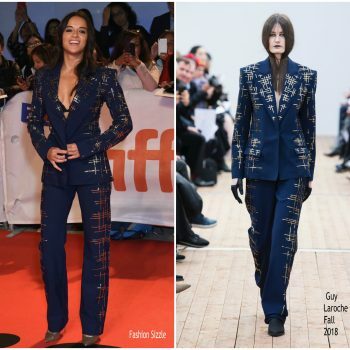 Michelle Rodriguez wore a Guy Laroche Fall 2018 crosshatch embellished suit to the Widows premiere at the 2018 Toronto International Film Festival. Michelle Rodriguez was in attendance at the New York premiere of ‘The Fate Of The Furious’ on Saturday (April 8). 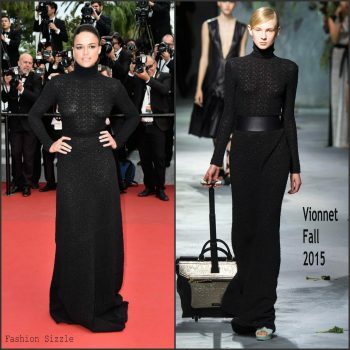 She wore a silver Vivienne Westwood Couture dress. Michelle Rodriguez was in attendance at ‘The Assignment’ New York screening on Monday (April 3). 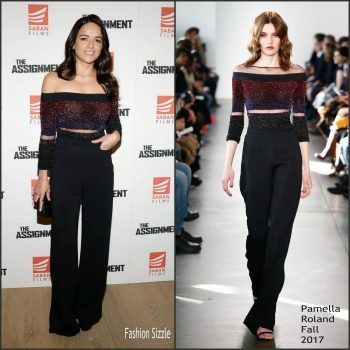 She wore a wore a Pamella Roland Fall 2017 embroidered top worn with black high waisted trousers .